Everyday that you wake up, you are given the same opportunity as millions of people across the world. You start off with the same number of hours, the same breath of life, and the same ability to decide how you will see the world around you. So, what is the difference between a person that sees the world as dark and grim, and the one that sees it as a beautiful place where the colors are a bit faded today? I believe that the difference is perspective. Our perspectives are the way by which we see the world, but it is also the lens that is colored by the environment cultivated within us. In other words, what happens in our hearts, determines the perspective that we view the world from. If you struggle with forgiveness and bitterness, your perspective will always be of one on guard because the world, through this lens, cannot be trusted. If you have struggled with rejection, guilt, or depression, the world will seem mean and unkind because you will feel that you have nothing to be thankful for. You will feel like an outcast in the world and your inner perspective will determine your outlook, actions, motivations, and even, the direction of your relationship. 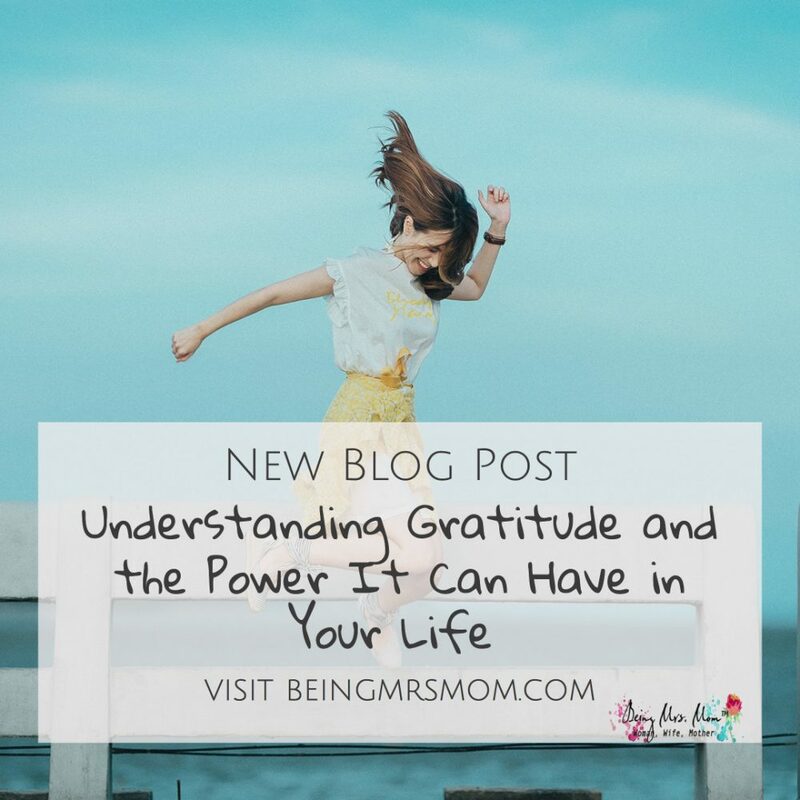 But what happens if you have a heart of gratitude, where you are constantly on the lookout for things to be thankful for? Well, like everyone else, you will always have 24 hours in a day, but when spent with a thankful heart, you live loved and optimistic. I’m sure that you’ve heard the saying, “Beauty is in the eye of the beholder.” I know that we apply this statement to many things, but you can take the same concept and apply it to the condition of your heart. If you look at your life and situation hard enough you can find something to be thankful for. I’d also like to point out that the opposite is also true. When you turn your heart from unthankful to grateful, you are expressing gratitude. Gratitude is the quality of being thankful. It is a readiness to show appreciation and to return kindness. Now why would you want to be grateful. Well, gratitude involves being appreciative for the things that God and other people have done for you. It causes you to look outside of yourself for goodness, and it makes you feel good in the process. This process occurs because possessing a grateful heart helps you to realize that the goodness you see is beneficial to you, which causes you to feel loved. Thinking like this keeps your mind upbeat, joyful, and optimistic. Positive thoughts breed positive emotions, actions, and interactions. When you feel good, life seems good. When this is true, no matter what happens, you can find the good and this is the way that you want to live your life. Gratitude causes you to feel like you are important to someone, cared about, and loved. You begin to feel like you matter. You see people as good and your perspective of life is blessed. When you see this, you will even begin to bless God for the way that He has cared for you. Research shows that gratitude has the power to make you resilient, more optimistic, and kinder. It helps you achieve your goals, feel more hopeful, makes you healthier, and can help you sleep better. If each person starts their day with the same ability to make a choice which effects their day, situation, and life, wouldn’t you want to choose the perspective that blesses you the most? If your answer is yes, then choose gratitude. It really makes the difference. If you have trouble focusing on the positive, go to the scripture. Scripture helps us to focus on what God says and it gives us a new perspective, when ours is out of whack. Make gratitude a goal by focusing on the things of God to take your thoughts outside of yourself. Begin to thank God for all that He has done for you, ever, in your whole entire life. Sometimes that’s what it takes to make your heart grateful. It may require you to look back over your life and remember where you have been to see where you are and bless the Lord. Your act of thankfulness will transform your thinking, surroundings, relationships, and your life. Today, I encourage you to think about the effects that gratitude can have on your life. Make a decision to have a grateful heart, so that you life can always be in an upward spiral. I also want to encourage you to take sometime to focus your thoughts and heart. That’s why I’ve written the 5 Days of Gratitude Devotional and Journal. It gives you the opportunity to focus your thoughts, emotions, and actions on being thankful. Get your copy today, it costs $7 and is packed with such great information. It blessed me to write it and I know that it will bless you to interact with it. I want to tell you that while it is a 5 day devotional, it is 44 pages of devotion that will send you on a biblical journey of checking your heart and your perspective, so don’t wait. 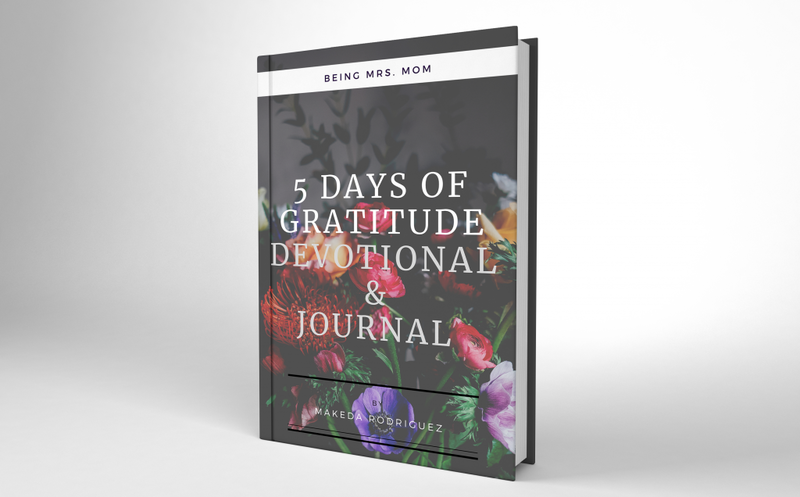 Get your printable e-book copy of 5 Days of Gratitude Devotional and Journal today, by clicking on the image below. Over the past 13 ½ years, I have gone from working mom, to student, and then to stay at home mom and back to student/SAHM again. When I look at the standard that the world sets, I realize am supposed to be able to do it all and still live a healthy life as a wife and mother. However, I have found this to be a task that I have not successfully achieved in all of my adult life, to the degree that I desire. When I attempt to tackle too much, I find that I am overwhelmed by the daily tasks and expectations that are set before me. I want to be, both, a great wife and a great mother, but when working hard at achieving these two goals and then trying to juggle a full-time job, it seems that I end up dropping the ball and despising one aspect of my life. For that very reason, I decided to give up the 9-5 for a while. I decided to focus on my education, which will afford me the opportunity do work a more flexible schedule while doing what I love. In the mean time I focus on being thankful for the little things. 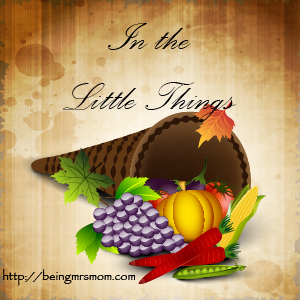 I am thankful for the conflicts that my husband and I have. They remind me that I am in a healthy relationship where my spouse is willing to challenge me. He helps to sharpen me like iron and he makes me better. I am married. I am thankful for the mandate that I have to balance my roles as mother and wife with other roles that I have. They remind me of how important it is to me to be a mother and a wife. These challenges show me that somethings will come up against my most important human relationships, but resilience and reevaluation are the keys to getting things back in line. I am a wife and a mother. I am thankful for the mounds of laundry that I tend to have. We have six people in our family and those mounds of laundry remind me that God has blessed us with tons of clothes and choices of what to wear. We have clothes to wear. I am thankful for the dishes in my sink. I have to take the time to wash them, either by hand or by dishwasher, but they remind me that we have all eaten and do so daily. We have food to eat. I am thankful for the toys to pick up off of the floor. They remind me that God has blessed us with an income to provide for our children’s pleasure. They get to play with things that they enjoy. We have a steady income and material things to enjoy. I am thankful for the time that I have to manage wisely. As a stay at home mom, I have a certain amount of time that I have to manage in order to be productive, while my family is away at school and work. This could feel overwhelming at times, but it is a blessing to have that time to decide what I would like to take care of and how I would like to do it. I am still alive and can manage my time. I am thankful that I have to tell my kids to stop running around the house or being so loud. I grew up as an only child in my house, so I having four children actively running around and playing are things that I had to get used to. However, their noise is a very pleasant reminder that they are healthy and adventurous. Their noise and lively activities remind me that I have been blessed with children and I am thankful. I have children and they are healthy. I am also thankful for the school work that I have to complete and the books that I have to read. They are reminders of the fact that I am receiving an education that will prepare me of various opportunities in life. I have the opportunity to be educated and make the best out of life. I have a sound mind. I have a long list of things that I could discuss, but I think you get the jest of what I’m saying. It is very hard to forget our blessings, especially when some of our struggles come from those very places. We could all take a look at the things that we complain about and realize that they are simply a blessing that we must learn how to manage. I hope that you have found this post encouraging. Do you have various areas of your life, where you tend to complain, but after reading this post, realize that you have more to be thankful for than to complain about? If so share them with us. If you have enjoyed my writing, please consider signing up for my email newsletter. I offer weekly encouragement and exclusive monthly content.